A self defense claim requires being in imminent danger of harm | Jon Katz, P.C. 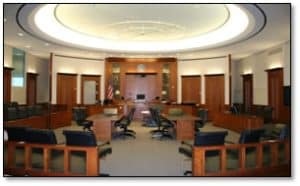 When a homicide defendant knows s/he will be found to have caused the decedent’s death, the defendant often finds himself or herself pursuing a self defense claim, or else a claim of a lesser level of culpability than first degree murder (for instance manslaughter or second degree murder). A self defense claim — which can apply to any assault or homicide prosecution — requires being in imminent danger of harm at the time of the killing. Carter v. Virginia, ___ Va. ___ (July 22, 2017). This week, the Virginia Supreme Court underlined how imminent must be that danger. Carter. Here, Carter went to the home of Jennifer Johnson, with whom he had a relationship on and off. He was in her bedroom a short time, her children heard a thud, he left soon after, and on the way out mentioned an ambulance to Johnson’s children. Johnson died of gunshot wounds within minutes. At trial, Carter tried presenting evidence that Johnson had previously caused and threatened violence to others, including to Carter. However, the trial judge limited said evidence to 2012 to the January 2014 date of Johnson’s death, even though Carter profferred numerous acts of violence by Johnson from before 2012. Furthermore, the trial court denied a continuance for Carter to have called Johnson’s mother in Carter’s case in chief, to testify about Johnson’s alleged recent threat — before the incident date involving Carter’s case — to Carter’s life. The Supreme Court declined to rule on the propriety of the trial court’s preventing testimony about Johnson’s alleged threat to Carter, finding overwhelming evidence of Carter’s guilt. The Supreme Court did find that the trial court erred by limiting the timeframe about evidence of Johnson’s past acts of violence, saying: “'[W]here an accused adduces evidence that he acted in self-defense, evidence of specific acts is admissible to show the character of the decedent for turbulence and violence, even if the accused is unaware of such character.’” The foregoing quoted rule of evidence is addressed in Barnes v. Commonwealth, 214 Va. 24, 25, (1973), and codified in Virginia Rule of Evidence 2:404. The Supreme Court, nevertheless, found no abuse of discretion by the trial court in establishing such a limited evidentiary timeframe. In other words, a self defense claim in a murder case can be hard to establish, and trial lawyers must always remember to object timely to any matters s/he wishes to exclude from trial. Jon Katz is a two-decade criminal defense veteran. To discuss your case with Jon, please call us at 703-383-1100.